The Roy Cape Foundation is using music literacy in Grenada with the hope of reaching the impoverished and unemployed youth at risk. Dr Roy Francis Cape, otherwise known as Uncle Roy or Pappy, was born in Trinidad in April 1942, but both of his maternal grandparents came from St Andrew, Grenada, where his relatives still reside. He was 12 years old at the then Belmont Orphanage when he was exposed to the influence of music after being given an opportunity to play an instrument. He later mastered the saxophone and today in his70s has influenced and moulded the musical careers of some of the world’s most influential soca and calypso artistes including Destra Garcia, Olatunji, Blaxx, Voice, and Ricardo Dru. Cape was diagnosed with prostate cancer in 2014 but has beaten all odds and continues to make his contribution through his foundation. The Roy Cape Foundation was established in February 2016 and registered under the Companies Act, to bring hope and healing to communities through music education. 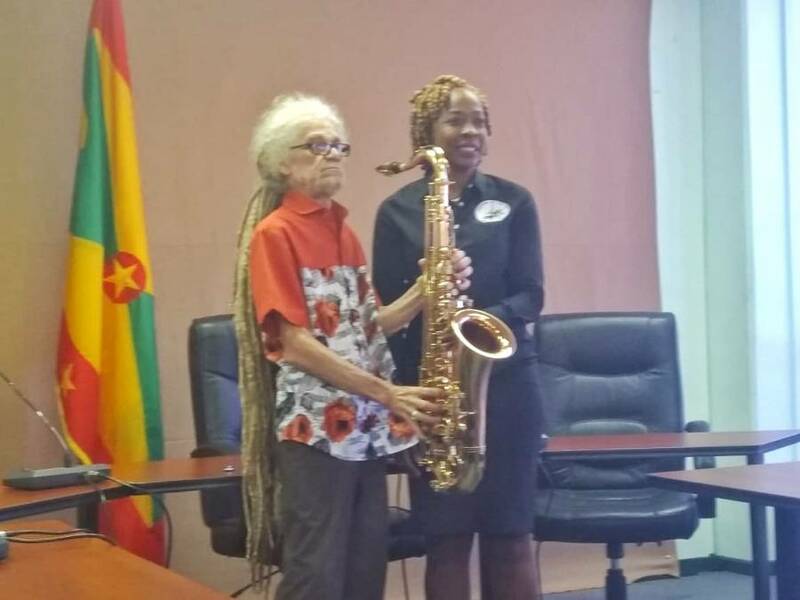 Cape is now giving back to Grenada, and through the foundation has donated various musical instruments including saxophones, trumpets, and drums to support the musical programme of the Ministry of Youth, Sports, Culture and The Arts. Cape said just like in Trinidad, here in Grenada there are a lot of young people who are trapped in a cycle of poverty with some of them having to resort to criminal activities. In fact, it was in January 2016 when a shooting incident within the community of Laventille, that claimed the life of 2 young boys on their way home from school, that formed the catalyst that gave birth to the Roy Cape Foundation. Caped received an honourary doctorate from the University of the West Indies (The UWI) for his contribution towards transforming the cultural artform landscape of Trinidad and Tobago and the wider region. On Tuesday, Cape handed over the donation of Instruments to Kate Skeeter Lewis, the Minister within the Ministry of Youth, Sports, Culture and The Arts with responsibility for Youth Development. “What they have contributed today will go a long way in enhancing the work that we do at the Ministry of Culture also enhancing what we do with our students in the music labs that we would have just implemented. We have one in St George’s where over 52 students are participating, playing different musical instruments. This will be good for them, giving them the opportunity to express themselves through music,” said Minister Lewis. The Ministry of Culture also received 35 copies of The Standard of Excellence Comprehensive Band Method which is used in hundreds of band programmes worldwide.